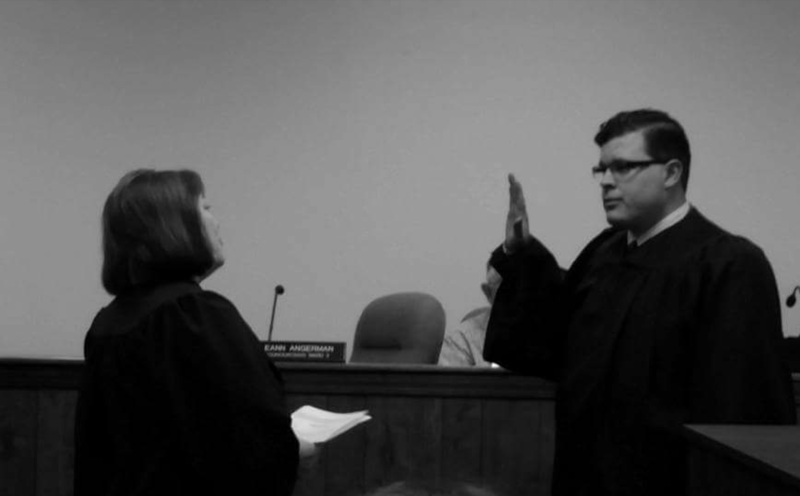 Home - Firm News - SFT’s Christopher Buckley Sworn in as Lowell Town Court Judge! SFT’s Christopher Buckley Sworn in as Lowell Town Court Judge! SFT is proud to announce that late last month, Attorney Christopher Buckley was sworn in as the Lowell Town Court Judge! Judge Buckley is only the third to serve in the court, succeeding Hon. Thomas Vanes (ret.) and Hon. Karen Coulis (ret.). (See NWI Times article here.) Judge Buckley was selected by a caucus of all Lowell Republican Precinct Committeemen by a unanimous vote to fill the vacancy of Judge Karen Coulis, and will serve out the remainder of the four year term ending in 2020. The Lowell Town Court was established in 2003 to serve the people of Lowell, handling criminal misdemeanor and traffic cases, as well as the Lowell Truancy Court. The position is part-time, and Buckley will continue to practice civil law and in some felony cases. Specifically his practice will focus on the areas of family law, real estate law, Indiana Home Improvement Act law, and Indiana property tax law. All city and town court judges are prohibited from defending clients in misdemeanor and traffic cases. Buckley is humbled at being chosen for the position, and says simply, “I have some big shoes to fill,” regarding Judge Vanes and Judge Coulis who preceded him. We wish him much luck in his new position, and will support him as he transitions into other areas of law practice. DISCLAIMER: The above article is for entertainment and informational purposes only, and is not intended to entice readers into retaining the services of Schwerd, Fryman & Torrenga, LLP (“SFT”).